Our commercial commissions can be found in restaurants, breweries, hotels, retail stores, fitness studios and modern workspaces. Below are selected examples of some of these works. If you are interested in commissioning our work for your commercial space please email us directly at info@lightboxprintco.com and we will be in touch to discuss your project further. These pieces were created specifically for the third location of Gather, open in the Short Pump neighborhood of Richmond, VA as of April 2018 and serving the needs of local entrepreneurs and those needing a workspace outside the home or traditional office. Complete with private offices, conference rooms, open space work areas and of course a coffee/happy hour lounge, this space is brimming with energy. We were approached by interior design team Campfire & Co. to create a piece of artwork that would add warmth and a strong pop of color to the space while also resonating with the young professionals of Richmond who would be passing by it everyday. We filled the allotted wall space with two panels, each 30"x40" that read as one large dedication to the River City. The form of the James River flows through the background of each piece, connecting the two panels and mimicking its context on a map. All of the content is derived from photographs we took around the city, screen printed by hand in varying colors we mixed specifically for this project. Some areas have a bit of extra background, painted or printed to add texture and depth to the overall finished piece. We were commissioned by local architecture/interior design firm Baskervill to create multiple custom works for the newly renovated Commonwealth Hotel, re-opened in November 2017 and located in the heart of downtown Richmond, across the street from the Capitol. Through the renovation, the hotel owners and interior designers were dedicated to preserving the rich history centered around the hotel's past as a major landmark of the state capital for 100+ years. All of the artwork throughout the hotel common areas and guest rooms was commissioned from local artists, while each of the floors' hallways are adorned with a mural depicting a different Richmond muralist's interpretation of their relationship to the city. The hotel remains a landmark, both architecturally and culturally while also now serving as a contemporary destination for a unique stay in Richmond or view of local artistic talent. Each of The Commonwealth's guest rooms contain two of our custom prints screen printed by hand, signed and numbered on the back. 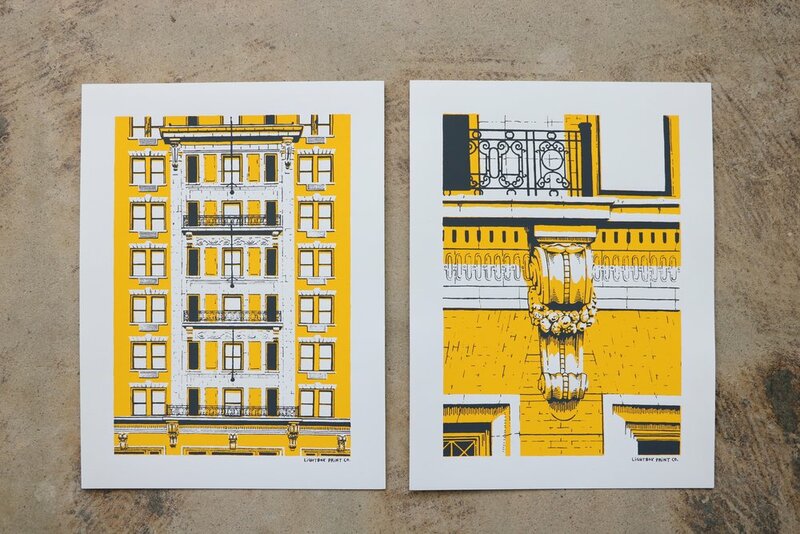 One print is of the hotel facade, cropped to show the repetition and symmetry of this style of architecture, the other of an architectural corbel detail found within the facade. A nod to our background in the fields of architecture and design, these prints capture the unique details of the hotel's exterior which began with a photograph that we translated into hand drawn layers for each stencil. As part of the hotel's main lobby (which serves partially as a gallery of contemporary art), we created a piece titled "Richmond Towers," which is comprised of four 16"x16" wood panels. Each layer is screen printed by hand using custom mixed ink colors, derived from photographs we took of various water towers throughout the city that contribute to Richmond's unique and historic industrial past.